Step 1 Place the mushrooms in a bowl. Cover them with hot water and let them soak until soft, about 30 minutes. Remove the mushrooms, rinse them and cut off the tough stems. (You can save them for simmering in vegetable stock). Slice the mushroom caps. Step 2 Meanwhile, bring a saucepan of salted water to a boil. Cut the asparagus on the bias in 3 or 4 pieces, discarding the tough white bases (about 1/2 inch from the end). Cut the carrots in diagonal pieces about the same length as the asparagus pieces. Step 3Add the asparagus to the boiling salted water; it should be covered generously. Boil until the pieces are barely tender, about 2 or 3 minutes; to check, lift a few on a slotted spoon and pierce them with a knife tip. Drain the asparagus, reserving the liquid. Rinse the asparagus with cold running water and drain it well. Step 5For the dressing, whisk the soy sauce, 2 teaspoons of hoisin sauce and 2 teaspoons of vinegar in a small bowl until combined. Whisk in 2 teaspoons of vegetable oil and a little salt, pepper and hot sauce. Step 6To serve the salad hot, heat 2 to 3 teaspoons of vegetable oil in a skillet over medium heat. Add the mushrooms, asparagus and carrots and a pinch of salt and pepper. Cook until hot, about 30 seconds. Add the dressing and heat for a few seconds, shaking the pan. Turn off the heat, add the green onions and sesame oil and toss to combine. Step 7To serve the salad cold or at room temperature, toss the dressing with the carrots and mushrooms. Just before serving, add the asparagus, green onions and sesame oil. Step 8Taste and adjust the amounts of salt, pepper, hoisin sauce and vinegar. In Recipes-list.com we have selected the most viewed recipes from category - Salads Vegetarian . Enjoy the best recipes specially selected for you! 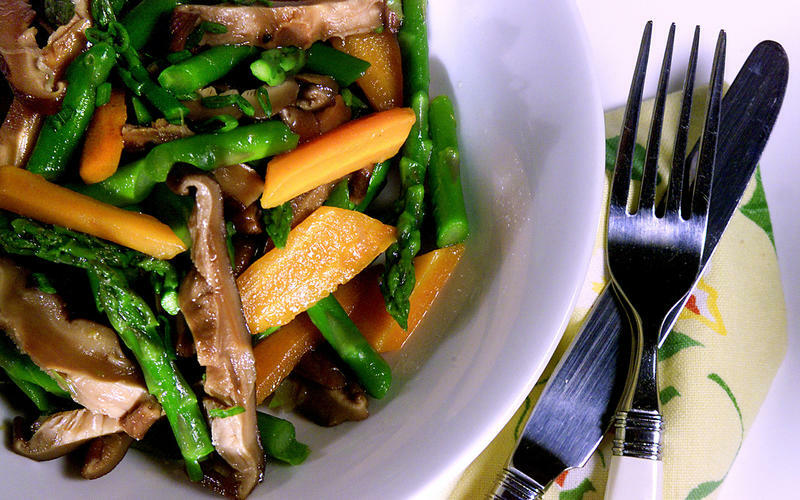 Asparagus Salad With Carrots and Shiitake Mushrooms is the right choice that will satisfy all your claims.